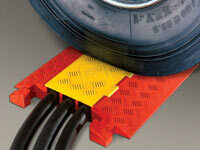 Polyurethane Construction for weather and abrasion resistance and a high load-bearing capacity. Non-Conductive Material insulates electrical cables from human contact and satisfies state and federal regulatory agencies. 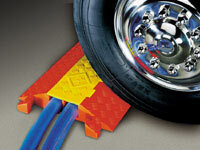 36" Length Per Lineal Protector makes length-of-run calculations easy to figure. 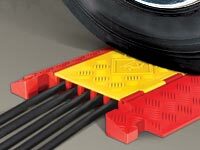 5 Bar Tread Plate Surface increases traction. Safety Warning Symbols permanently molded into lid warn pedestrians of trip and/or electrical hazards. Modular Interlocking Design is Lightweight; Easy to transport, setup, breakdown, and store; Multi-length applications. Recessed Carrying Handle allows for moving with ease. Universal Safety Colors for High Visibility.